Flagship smartphones offer better cameras every year. But they still lack one important DSLR feature – interchangeable lenses. olloclip is a set of quality lenses that snaps right onto your smartphone’s camera. Keep them with you in a compact, easy to attach device, and capture amazing shots without your camera bag. The wide-angle lens doubles the field of view, letting you capture classic architecture or sweeping landscapes. To shoot with even more artistic flair, there’s a fisheye phone camera lens that can curve any large subject into the frame. And when the photographer’s eye spots a tiny wonder like an exquisite flower, switch to the macro lens to focus in on even the tiniest details. olloclip works for video as well as stills, and can be used with the back- or front-facing cameras (fisheye selfies are wild). Sturdy aluminum construction holds the multi-element lenses in place, maximizing light for priceless photos. Up your creative game with less hassle and expense than a bulky DSLR. 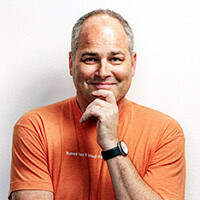 Hello this is Mark Sweester, Sales Director Lifestyle & Specialty, at olloclip. I'll be acting on behalf of our founder Patrick today. We're excited to hear your questions and look forward to hearing about all the possibilities that olloclip can bring to your camera phone endeavors. 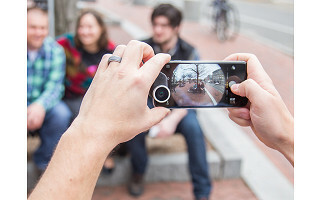 @Mike @Vanesa @Dinah - The olloclip lenses are designed to fit specific mobile devises. 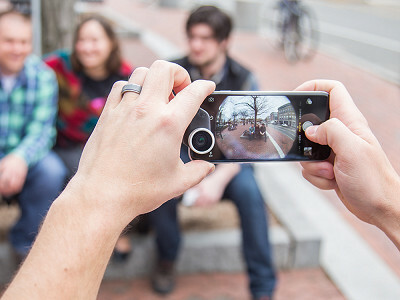 Meaning we have lenses specifically fit for the iPhone 5/5S, 5C and the Samsung S4 and S5. @Patrick The ad didn't show the S5 adaptor. Can you add to the list. Hi Richard, I'm a bit confused. What list are you referring to? If you click on the Samsung Galaxy 4-in-1 lens box above you will be able to select the 5S. @Mike The info says that it cannot be used if you have a case on your iPhone. Everybody has a case on their iPhone. What gives? Hi Annie, you're right, most people have cases for their phones. But there are so many different size cases it can be very difficult to create lenses to fit each one. That's why the lenses come to fit the standardized size of the phone. How about the iphone 6 and 6 plus? @Diggs @Dinah - Yes, the 4 in 1 lens is available in iPhones - 5, 5s, 6 and 6 plus. What a great idea - just curious why you went with the iphon 5C instead of the iphone 6 or 6 plus? @Sonia and are there plans to produce one for the mini ipad, since I see lots of parents at schools with the ipad recording - it would be nice to get that close up of your child. Again, great idea! Hi Sonia, the olloclip is available for the 6 and 6 plus. It is under the option that says iPhone 4-in-1 lens. As for the mini iPad, there are options available. Contact out Community Experience team here and they will get you in touch with Mark. I see iphone and Galaxy listed. What about Droids? Hi David, for now olloclip is only available for Apple and Samsung products. Is there one that works with the HTC One? Hi Jon, not at the moment. Olloclip is just available for Samsung and Apple products right now. How about the four in one for the Samsung Galaxy 6s Edge? Hi Kathleen, as of now, no. But a 4-in-1 for the 6S Edge is planning to be rolled out in the future. When it is available, we will be carrying it! @Kathleen It would be best to subscribe "Be the First To Know" to the olloclip mailing list to be updated on new products. We do not have any plans as of now for new Samsung lens products. Would like to know if these will be available for the Moto X ?. Hi Michael, unfortunately not. The olloclip is only compatible with Samsung and Apple products. Does it fit the Moto X? @Brian Will the lens fit over an Otter box case or do I have to remove the case and put the lens on phone itself? Hi Brian, the olloclip is only compatible with Apple and Samsung products. Bruce, you will have to remove the Otterbox case to use olloclip. @Bruce The olloclip lens products fit either on the raw phone (without a case) and or our case. We currently have a case for the iPhone 4 or 5. And are launching our if 6/6 Plus case next month. Contact The Grommet Community Experience team here and they will get you in touch with me. Does it work if you have an Otterbox on your cellphone? Hi Michael, it does not. You will have to remove the Otterbox case to use it. Does it fit the iPod touch?????? @Phil Yes, if you have the iPod Touch 5th generation. Then you would purchase the 4-IN-1 lens for the iPhone 5/5s. There is an adaptor that comes with the lens kit that you would just simply slide on. Nothing for the Note 4? @Kevin Not at this time. Would this work on a Moto X 1st generation? @Gae No, I'm sorry but we do not have one that fits the Moto X devices at all. I am assuming from the comments below that if I buy this for my 5S and later upgrade from a 5S to a 6 I will have to buy a new olloclip. Correct? @Steven That is correct. The way our lenses mount on the various devices is very precise, our lenses are devise specific. @Patrick It would be nice if you could create a lens that has some adjustment to the fit. I have the Samsung ATIV s neo and the camera lens is located in the center of the back just like the Galaxy only a little bit lower than the Galaxy. Is this a possibility or do you figure that would make it too difficult for people to mount it properly on their own phones? Will this fit my Sansung Galaxy Alpha? If so, I am ready to order. @Laurie No, I am sorry, it does not. Which one do you get for the iPhone 4? @Lauren olloclip offers a 4-IIN-1 lens for the iPhone 4/4s. Please contact The Grommet Community Experience team here. and they will get you in touch with me. @LIANE Sorry, we do not offer a lens for the LG3. Just wondering what kind of delay there will be before a Samsung S6 olloclip becomes available. @Michel It would be best to subscribe "Be the First To Know" to the olloclip mailing list to be updated on new products. Do you make one for the Motorola moto G that has lens opening center of back about half-imch from top of camera, and if not will one of the I phones work? How about front facing lens same camera? Hi William, the olloclips are specifically made for Apple and Samsung products. So unfortunately they won't fit on your Motorola. I have an LG. The lens is in the middle at the top of the phone. Would the Samsung lens work? Hi Laura, the olloclips are very precise in the phones they fit so unfortunately the Samsung lens will not work. Rats! Well, I'll check back from time to time to see if you expand. What a cool thing! I have a galaxy tab 3, The 7 inch model. Do you have a setup for it? Would be a great addition to this awsome video creation tool. Hi Julian, currently there is no lens for the Galaxy Tabs. I'll let Patrick chime in if there are any plans for it in the future. Stay tuned! Will it fit over the Life Lock case for the 6? Hi Charles, unfortunately not. The lenses will only fit over cases olloclip has designed. Does the olloclip fit over an Oyster case for Samsung S phones? Hi Dayle, as I mentioned above, the lenses will only fit over olloclip-designed cases. Just about to click 'submit order' until I remembered reading it does NOT fit over your phone case - bummer - sounded great up to this point. Don't want to be bothered having to get phone in and out of form fitting case which is not easy. Hi Deb, as mentioned above, you can use the 5/5S case for an iPod touch 5th generation. I see the cases for the 4 & 5 but do you offer a case for the 6? Hi Charles, as was mentioned frequently above, there is a case for 6 and 6 plus. You should see that option on the same button as the 5 and 5S. I just want to make sure I understand after reading the item details I have this right. Before using Olloclip the phone case and the screen protector must be removed prior to taking a picture? Sounds to me like you all are trying to help Apple monopolize this market alright. I do not have "i" Products. I had a couple i Touch devices but tossed them due to poor performance and outrageously high cost. I presently have an LG device that out performs comparable APPLE devices and cost a lot less, and is less aggravating to maintain. Oh yes, many more apps, longer usage time and better battery life. I'm just sayin', you really ought to consider getting on track with other quality products as well as with APPLE and SAMSUNG. Hi Michael, I'm sure as olloclip continues to grow they will look to expand into other phone models. At the present time, Apple and Samsung phones are the most popular so that is why you see lenses for them. I must say, your trash must be literally everyone else's treasure. Is there any chance that there would be lenses to fit an ipad? Hi Don, there are olloclips for iPads. Get in touch with our Community Experience team here and they can get you in touch with Patrick and Mark. This is such a great idea. I have an iPhone 4S, however. Am I out of luck. Hi Valerie, you are very much in luck. There are olloclips available for iPhone 4's. Just contact our Community Experience team here and they'll get you in touch with Patrick and Mark. Flagship smartphones offer better cameras every year. But they still lack one important DSLR feature – interchangeable lenses. olloclip is a set of quality lenses that snaps right onto your smartphone’s camera. Keep them with you in a compact, easy to attach device, and capture amazing shots without your camera bag. The wide-angle lens doubles the field of view, letting you capture classic architecture or sweeping landscapes. To shoot with even more artistic flair, there’s a fisheye phone camera lens that can curve any large subject into the frame. And when the photographer’s eye spots a tiny wonder like an exquisite flower, switch to the macro lens to focus in on even the tiniest details.